Welkom in Utrecht (Welcome to Utrecht) enables citizens and organisations in Utrecht, wishing to organize an activity for asylum migrants, to make this happen. When it comes to these activities, you may think about sports, children's activities, concert visits, eating together or just a meeting. How could you participate or just learn more about what we are doing? You can meet the team of Welkom in Utrecht every Thursday morning in the AZC, Joseph Haydnlaan. We provide information about the activities. You can also register there for an activity. You can also check out the agenda of this website. Or drop by at our office at Joseph Haydnlaan 2A (near azc). Dutch government and COA websites have information about the asylum procedure, housing and education. The website of Vluchtelingenwerk Nederland is also helpful. More information is available from non-governmental sources. The Yalla foundation, for example, has a lot of information about IND, housing, language and education in the Netherlands. Though the Yalla Foundation is primarily aimed at refugees living in Nijmegen, it contains useful information in English for anyone new to the Netherlands. Each country has its own customs and habits. The website, Net in Nederland, is a good introduction to Dutch culture. For example, most Dutch people ride bikes and often drink coffee after dinner. The webpage is in Dutch, English and Arabic. 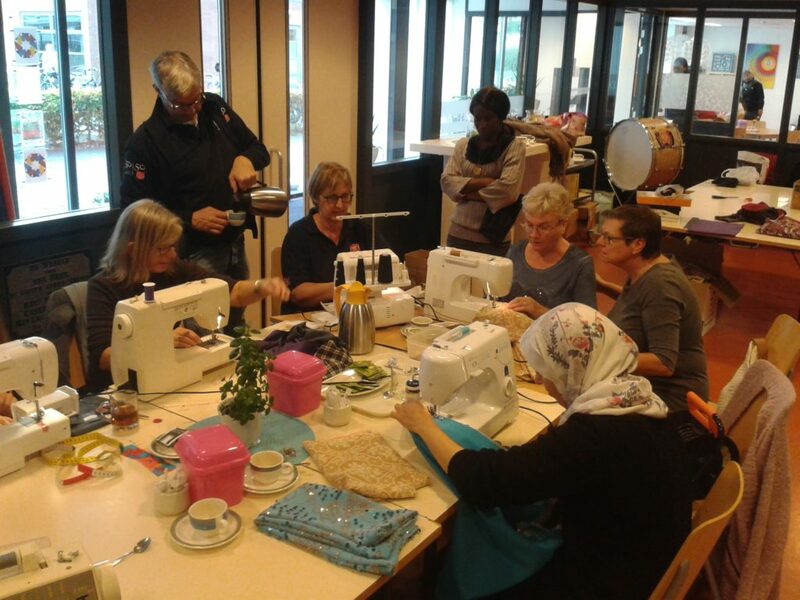 In Utrecht regular voluntary work is offered by many different organizations. This is not about a job you do only once, but every week on one or two days. During several weeks or months. Here beneath you see what the current offer is. Volunteering is very common in the Netherlands. It's a good way to meet people, see how the Netherlands works, stay active and gain experience for a future job. Caution: not every refugee is allowed to volunteer. See below what you are and are not allowed to do. Are you a refugee without W-document? Then you’re not allowed to volunteer. Do you have a W-document? Then you are allowed to volunteer if this is done according to the Dutch law. that your work is serving society. Washing dishes in a restaurant is NOT volunteering. A restaurant makes a profit and you should be paid. But if - for example - you work at a restaurant that helps people in need, such as Resto van Harte, then you can work there as a volunteer. Resto van Harte is not a commercial business. If you clean the houses of people who would normally pay for such services, then it is NOT volunteering. However, if you want to help an old person by cleaning the house once and awhile without being paid, then this is allowed. The organization for which you are going to do voluntary work, needs a so called Vrijwilligersverklaring of the UWV. The UWV checks for compliance within the law. If everything is alright according to the law, the organisation will have a Vrijwilligersverklaring. Note: A Vrijwilligersverklaring is given for the work you do, not for you as an employee. If several people perform the same work, only one verklaring is needed. Status holders who are under the responsibility of the COA. If you have a permit - a status - and you are under the responsibility of COA, then you are allowed to do voluntary work. The Vrijwilligersverklaring is not necessary. If you have a house and receive social assistance (uitkering), then the work you do should be reported to the municipality by the organization you work for. The municipality will decide whether the proposed voluntary work is actually not work that should be paid. If that is the case, then you should not do it as a volunteer. If that is not the case, then you are allowed to volunteer. A volunteer fee is money you can use to pay your expenses, such as transportation to work or work-related phone calls. Often, a volunteer fee is a way for your boss to say thank you. The organization you work for appreciates what you do and would like to give you some money in return. This is allowed, but only if it sticks to the law. If you are under the responsibility of the COA, you may still receive a volunteer fee. However, this may reduce the amount of money for living expenses that you receive from COA. Some of the money you should give back to COA. You can keep gifts or rewards unrelated to volunteer work. Looking for cheap or free clothing and furniture? There are stores that specialize in cheap and sometimes free clothes. Note, these stores sell used furniture and clothes. There are also residents of Utrecht offering free stuff. Take a look at the many facebook pages, such as Gratis ophalen in Utrecht en Omgeving. Or Gratis af te halen in Utrecht. At various stores you can find used clothing and furniture. Often, the shops deliver the furniture to your home. Delivery is not free, but usually quite cheap. The ARM, for example, has a lot of furniture and clothing. You can also rent a ‘bakfiets’ to cycle small pieces of furniture home yourself. Verlengde Hoogravensweg 63-69. More information can be found here. Oudegracht 247 and 270. More information can be found here. Emmaus Utrecht. There are 5 stores. Sometimes they sell only clothes, and sometimes furniture. They offer bakfiets rentals as well. Check out the websites below for more information. De Waarde is situated in Hoograven. You can buy used furniture there. To those refugees who got new houses and are ready to move out in the near future, first of all, congratulations! Moving out can be a huge job. Do you have problems with language? Do you have problems with choosing the right home appliances? Do you have problems with transportation? Do you need a local citizen to help with these issues? We have an initiative called ‘Verhuisgroep', where local Dutch citizens volunteer to help newcomers with the move-in process. These local Dutch citizens can help you speak with second hand shopkeepers and choose the right home appliances. Also, some volunteers may have used stuff to donate. If possible, they will give you a ride to the secondhand shops to make sure that you purchase the correct appliances. In addition, volunteers can help with delivering stuff to your house. Concerned local citizens are willing to donate their time and resources in order to welcome the newcomers in the city. Please kindly inform us at least two weeks before your move-out date, so we can find a volunteer to help you. If you need help, don't hesitate to let us know by apping Hellen at: 06 511 923 16. A buddy is someone - mostly of Dutch origin - that would like to help you with things as a friend. Talking Dutch for example. Or going to the cinema. There are several buddyprojects in Utrecht. Take a look at the following. 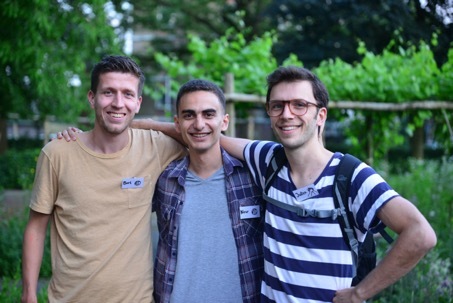 Stichting Buddy to Buddy links refugees to the residents of Utrecht. In this project, buddies help refugees to get to know the society. On the other hand, of course Utrechters also learn from the refugees. Besides matching buddies, Buddy to Buddy organizes activities with the participants, with the focus on meeting each other, for example by eating together. A buddy trajectory lasts 4 months. Click here for more information about Buddy to buddy or check their Facebook page. You can sign up here or y sending an email to buddytobuddyutrecht@gmail.com. Are you between 18 and 23 years old and do you speak a bit English or Dutch? 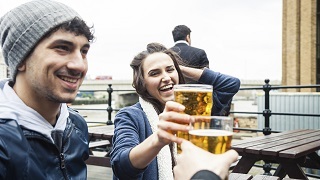 Then join the Marhaban project: doing activities together with students from University College Utrecht: playing sports together, visiting a museum, a theater play, a concert, a movie or just drinking a beer or Coke, it’ s all possible with this buddy project. Once a month, you do an activity with the whole group. This group consists of 10 students and 10 refugees. Then you are going to do activities at least once a week with a student. More information about University College Utrecht can be found here. Visit the facebookpage of the project. Are you LGBT (lesbian, gay, bisexual, transgender) and do you want to meet other LGBT? Cocktail is a project for LGBT refugees in the Utrecht region. They organise buddy contacts between LGBT refugees and volunteers. Once a month, they spend a Saturday evening with the whole group – to have dinner together, chat, dance and enjoy gezelligheid. If you are not looking for a buddy, no problem, you can also just join their activities. Want to join Cocktail or learn more about the project? Send a WhatsApp to Hellen from Welcome to Utrecht (06 511 923 16) or contact Cocktail directly via cocktail@cocmiddennederland.nl. Handwerkatelier Van Hagar tot Ruth has several places where you can learn needlework and sewing. You already know how to do this? Maybe you are a tailor or seamstress of origin? Then you are invited to join as a volunteer. You will meet new people and practice the Dutch language. The production of the volunteers, will be sold. The returns will be used for materials which are used in the workshops. Also, it will be used for something fun together.